Entry into the LPGA's Hall of Fame is considered to be one of the most difficult attainments in today's world of sports. Prerequisites for membership are that a player must have been a member, in good standing, of the Association for 10 consecutive years and have won at least 30 official events, including two major championships, or have won 35 official events with one major championship title, or have claimed 4O official Tour events exclusive of any major championships. The hall of Fame was established in 1967 by the LPGA membership. It was determined that initiation into the Hall would be limited solely to LPGA members and that those who already had been inducted into the Women's Golf Hall of Fame, established in 1950, would become the Hall's first inductees. Thus, it was Patty Berg, Betty Jameson, Louise Suggs, Babe Zaharias, Betsy Rawls and Mickey Wright who set the standards by which the future Hall of Famers would be measured. Following Mickey Wright's induction in 1964, 11 years passed before Kathy Whitworth met the requirements for induction in 1975 and became the seventh inductee. Since then, Kathy has redefined the meaning of champion and set a record that likely will stand forever: her 88 career victories are more than any other professional golfer. In 1977, Sandra Haynie and Carol Mann became the next two members to join the elite Hall of Fame club. In 1982, JoAnne Carner collected her 35th career win at the Chevrolet World Championship and became the tenth player inducted into the Hall. The eleventh inductee was Nancy Lopez. She won her 35th tournament in 1987 at the Sarasota Classic. However, she had to wait until July to be inducted due to the 10-year membership requirement. Ironically, the Sarasota Classic was the site of Lopez' first career win in 1978. Pat Bradley, who is the winner of six major championships, qualified to become the 12th LPGA Hall of Fame inductee in 1991. Beginning her 1991 season, Pat needed four victories to qualify for the Hall. She captured an LPGA title early in the year and added three more at the end of the 1991 season to gain entrance. Patty Sheehan officially joined this elite group in 1993. Entering the 1993 season, Patty needed just one victory to reach the magical mark of 30. Her victory at the 1993 Standard Register PING did just that. She went on to win the Mazda LPGA Championship later in the year to mark her fourth career major championship title. The most recent inductee is Betsy King. She became the 14th member to qualify for the LPGA Hall of Fame by virtue of her 30th career win at the 1995 ShopRite LPGA Classic. There are several active players within reach of the LPGA Hall of Fame requirements. Entering the 1996 season, Amy Alcoft has 29 LPGA victories and only needs one more win to gain entrance into the elite Hall of Fame. Beth Daniel, who won one LPGA title in 1995, begins her 1996 season with 32 victories including one major championship title, the 1990 LPGA Championship. To become an inductee into the LPGA Hall of Fame, Daniel needs either one additional major championship win or three more official Tour victories. 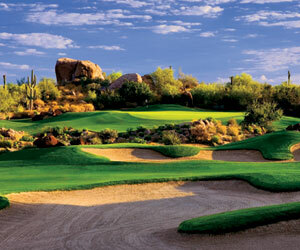 Stay in charming Old town Scottsdale for your next Arizona golf trip at the Hyatt Place in Scottsdale. Located walking distance from shopping, restaurants and nightlife this upscale hotel is perfectly situated in the heart of the entertainment district of Scottsdale.